July 25, 2018: The setting of overall tonnage limits as contemplated in the draft GSM is wholly inadequate. It should be abandoned. A practical, enforceable method would be a better approach for the permittees, the Department of Health and Environmental Control and the people of South Carolina. health and safety of its people. Glendale School Road in Glendale Springs, NC. Public Comment Period: September 4 through October 6. J.W. Hampton 421 site in Watauga County, NC. BREDL and High Country Wataugans Against Toxins Close to Home July 7, 2015 letter to Watauga County Board of Commissioners regarding Amendments to the High Impact Land Use Ordinance. December 2013: BREDL Report 13-346: Toxic air pollution levels based on the permit present an unacceptable level of risk to the residents living near the plant site. The permit should provide no confidence to county officials that public health and agricultural livelihood would be protected. February 23, 2010: Testimony of BREDL's Louis A. Zeller before the Onslow County Board of Adjustment regarding Special Use Permit for asphalt plant proposed by Morton Trucking, Inc. This is a report on APAC-Atlantic, Inc., one of the nations largest transportation construction contractors. The League's report lists APAC's violations of environmental laws and citizens complaints for the asphalt plants which the company operates in Rutherfordton, Burnsville, Penrose, Hendersonville and Morganton, North Carolina. Our report is based on public records on file in the NC Department of Environment and Natural Resources Division of Air Quality. The companys track record in western North Carolina reveals a corporation that shows little care for the health and well-being of the people who live nearest the asphalt factories it operates. March 8, 2002: The Blue Ridge Environmental Defense League Bethel-Cullasaja community health survey report. The Bethel-Cullasaja community is the site of an asphalt plant permitted to produce 180 tons/hour and 100,000 tons/year of paving asphalt. March 8, 2002: The Blue Ridge Environmental Defense released a study showing the adverse impacts on property values and quality of life around an asphalt plant in Pineola, North Carolina. APAC Atlantic proposed asphalt plant in the Henrietta community of Rutherford County, NC. 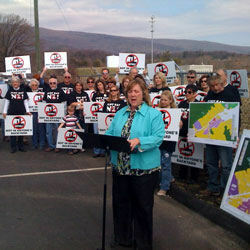 July 25, 2003: BREDL and WEAG cite numerous flaws with DEQs approval of Wythe County asphalt plant. Groups request DEQ to stop relocation and re-open permitting process. Read Press Release | July 25, 2003: BREDL and WEAG letter to Virginia DEQ Director Robert Burnley requesting determination of permit exemptions. (.pdf) | More information including BREDL/DEQ correspondence, background, pictures. June 30, 2003: EPA Region IV letter to Dr. Rick Weisler stating that current laws are not enough to offer "consistent and comprehensive environmental protection strategy." The EPA letter writer urges Dr. Weisler to continue his work to document unexpected disease clusters and contaminant associations near asphalt industry in Salisbury, NC. June 13, 2001 - The Citizens Against the Asphalt Plant (CAAP) files a lawsuit on Wednesday before an administrative law judge seeking to force more controls on Tarheel Paving Co.'s asphalt plant in Henderson County, NC. APAC Atlantic - Henrietta community of Rutherford County, NC. Public Comment Period: September 4 through October 6, 2015. Public Hearing on October 6, 2015 at the Ashe County Courthouse in Jefferson, NC. BREDL August 25, 2015 letter to NC DENR requesting public hearing for Appalachian Materials LLC, Glendale Asphalt Plant. June 30, 2015: Today BREDL and its local chapter CHASE recommended that officials in Dekalb County Georgia order a Developments of Regional Impact (DRI) study to assess impacts of a proposed asphalt plant in Lithonia. DRIs are done for projects likely to have regional effects beyond local government jurisdiction. Pollution from an asphalt plant would have a negative impact on the Atlanta area, which is already designated as being in non-attainment for national ambient air quality standards (NAAQS) for PM-2.5 and ozone.